Ellis Island in the early 1900's. 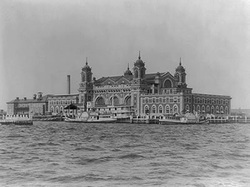 Use the links below to learn about Ellis Island, the first stop for many immigrants when they arrived in the United States. Take an online tour of Ellis Island. Learn about immigration in the late 1800's and early 1900's through The Ellis Island Experience.